Jump! Jump! Jump! Has been created as a running activity game for children between the ages of 3 to 6 years. As a player you control a kangaroo that must run around and collect as many apples as it can. There are dangers lurking in the form of cactus plants and porcupines. Those prickly items will interrupt the success of apple gathering and set the player back. 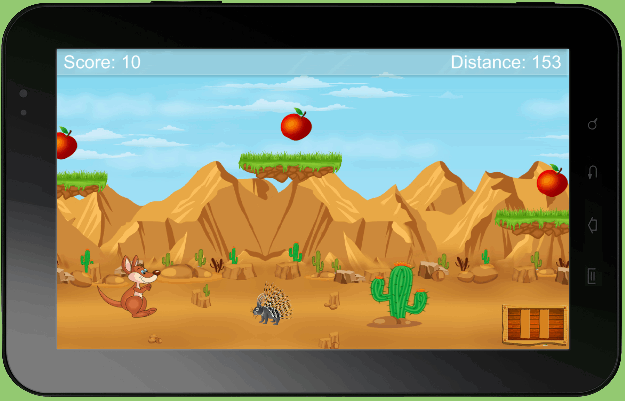 The idea of the game is to see how fast you can take the kangaroo through the screens collecting apples on your way. The more apples you collect the better. So the game allows the child to challenge themselves to do better than they did the time before. It helps them to build eye to hand coordination skills, and it entertains them. If you tap on the button once the kangaroo will jump up and grab the apple it sees, but when the apple is too high for the kangaroo to reach you might have to tap twice so it can jump higher. 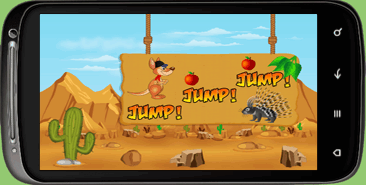 The player will have to decide how many taps it will take to make the kangaroo jump to the right level to grab the apples. They have to learn to judge this distance while speeding through the worlds and dodging the cactus plants and porcupines that can put a halt to their progress. The game graphics are very good. The kangaroo is an engaging character that the children will love, and the details of the landscape, the cactus, the porcupines, and the apples, are pleasant. The colors are bold and seem to captivate children, while they mix well together to make them easy to view. Young children will love the animated characters, the look of the scenes, and they will play longer because of it. Keeping a child’s attention is not easy, so the game designers made sure that the game moved along quickly, and had enough changes during play to keep the kids interested in it. If a game simply has a child repeat an activity over and over the child will quickly become cored and stop playing. The average child of 3 to 6 years will not easily get bored of the action in this game. The controls are easy to master so the younger child can play without becoming frustrated. Often games require children to use difficult controls and this causes children to become agitated when they cannot master the motions necessary to play. The simple controls on this game allows the child to play easily and this means that they have more fun, play longer, and they do not even realize that what they are doing is beneficial to their fine motor skills. As the young child plays the game they have to learn to coordinate when they tap on the control to make the kangaroo jump with where the kangaroo needs to be to get the apple. If they jump too quickly they do not reach the apple, if they do not jump high enough they do not get the apple, and all of this allows them to increase their ability to see something and have their hands respond in the right manner to touch it. These fine motor skills are needed for writing, tying shoes, coordinating your hands to work a keyboard, and many other aspects of daily life that we take for granted. If the child can increase their skill levels while having fun then they will benefit later in life. The parents benefit immediately. This game is fun, and it is engaging for children to play. They get to make the kangaroo run, jump, dodge bad things like porcupines and cactus, at a level that is designed specifically for their skills. You will also find that as parents you will enjoy the game almost as much as the children do. Yes it is really simple, but you will enjoy challenging yourself to run through the scenes faster and gather more apples. It is almost impossible not to smile while you play this game. Your child will love the game, they can easily work the controls, and they will love having a game they can play with you. If you like running games, then this one is a must for you to have.